Given the explosion in recent years of scholarship exploring the ways in which disability is manifested and performed in numerous cultural spaces, it’s surprising that until now there has never been a single monograph study covering the important intersection of popular music and disability. George McKay’s Shakin’ All Over is a cross-disciplinary examination of the ways in which popular music performers have addressed disability: in their songs, in their live performances, and in various media presentations. 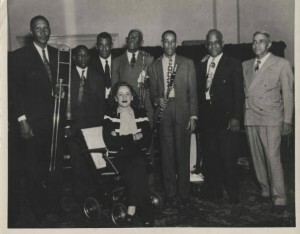 By looking closely into the work of artists such as Johnny Rotten, Neil Young, Johnnie Ray, Ian Dury, Teddy Pendergrass, Curtis Mayfield, and Joni Mitchell, McKay investigates such questions as how popular music works to obscure and accommodate the presence of people with disabilities in its cultural practice. He also examines how popular musicians have articulated the experiences of disability (or sought to pass), or have used their cultural arena for disability advocacy purposes. Here I am discussing Shakin’ All Over on the BBC World Service programme, Newshour, with British pop singer (and polio survivor) Steve Harley. And below that is a short video of me reading from the final section of the book. And finally a little bit of a taster of its contents, chapter by chapter. HALLO TO YOV OVT THERE IN NORMAL LAND. The out-of-controllability of the pop body has been a persistent feature since its early days. 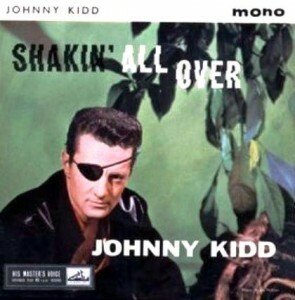 From ‘All shook up’ in the United States and Johnny Kidd and the Pirates’ ‘Shaking all over’ (1960) in Britain, songs about uncontrollable neurological tremors, as physical symptoms conflating the ecstasy of sexual attraction and of dance, are heard from rock and roll on—and are themselves prefigured in the pleasure and fear of the transcendent body in the jazz and dance musics of the first half of the 20th century as well (Stras 2009). There are identifiable and powerful links between popular music and the damaged, imperfect, deviant, extraordinary body or voice, which can be, and surprisingly often is, a disabled body or voice; these links have been overlooked in much critical writing about popular music. Popular music has always been about corporeal transformation or excess and the display of those—there has always been ‘a whole lot of shaking going on’—and reading that shakiness in the context of the disabled body is the starting point for opening up fresh insights into both popular music studies and cultural disability studies. The purpose of this book, then, is to explore the common cultural and social territory of popular music and disability, which has been a hitherto neglected topic. It is situated at a nexus of disciplinary or sub-disciplinary concerns: disability studies, popular music studies (including musicology), cultural studies, performance studies, gender studies, and theory. It is intended as a timely musical contribution to the critical dialogue of recent years around disability culture, as one corrective to the relative silence of popular music studies here. Shakin’ All Over is the first book looking right across the popular soundtrack of ‘our time, crip time’ (McRuer 2006, 200). We are here already, in polio land. This first chapter is the most historically situated of the book, as well as in some ways the most medically restricted. But it is also intended as something of an overview, to give a sense of the scope of how disability figures in popular music and rock, and it opens some key areas and artists for further discussion later. It focuses largely on the rock and roll generation of polio survivors: children and young people from the late 1940s to the early 1950s who contracted poliomyelitis ( ‘infantile paralysis’) during summer epidemics in the last few years before reliable vaccinations were widely available (in the west). In using polio as the focusing device I am aware that I may seem to be privileging the medical condition and its consequent disabilities over the people, the artists concerned, and their cultural products. But I am interested in the historical specificity of the disease in the postwar west. The introduction of the vaccines that successfully eradicated polio within a few years made that generation dramatically the last (in the west), while the chronological coincidence of the rise of pop culture would lead in a decade or two to a remarkable generation of pop and rock musicians who had been shadowed by ‘the crippler’, as polio was known colloquially in the USA. 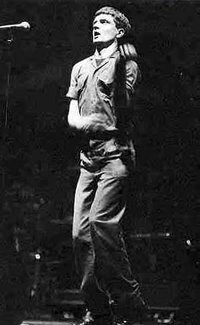 I discuss these, and go on to look at the work of Ian Dury (1942-2000), who was for some years the highest profile and most outspoken visibly physically disabled pop artist in Britain. This made Dury ‘one of society’s ultimate “not me” figures’ in the cultural context of the wannabe pop world, of course, but he is of special interest due to his songs around the topic of disability, his inventive and provocative ‘narratives of corporeal/cultural difference’, in Rosemarie Garland Thomson’s terms (1997, 41, 16). I know, the chapter title is Dog Latin. We’ll chase that tale later. 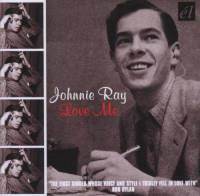 In this chapter I explore ways in which the voice has sung the disabled body in pop and rock. Simon Frith has pointed out that ‘[s]ingers use non-verbal as well as verbal devices to make their points—emphases, sighs, hesitations, changes of tone; lyrics involve pleas, sneers and commands as well as statements and messages and stories…. It’s not just what they sing, but the way they sing it that determines what a singer means to us and how we are placed, as an audience, in relationship to them’ (1989, 90). It’s not just the relational meaning of singer and audience either, but also—particularly, one might argue, in the context of consumption of recorded rather than live performed music, when the voice is present and the body absent—a meaning of the body itself. According to Frith, ‘[t]he voice as direct expression of the body … is as important for the way we listen as for the way we interpret what we hear’. Although we do not necessarily have guitars or keyboards or drums, what we do have in common with our singers is that ‘[w]e have bodies too, throats and stomachs and lungs’ are usually included (Frith 1996, 192). And we like to sing along in some form, in accompaniment, in sympathy, in tribute, or in karaoke. We do this even when we are seemingly not capable of it; it is a participatory pop pleasure. Thus can singer and fan bodies combine, in vocal harmony (even if out of tune). The body is integral even in the terminology of singing—we speak popularly of a ‘head voice’ or ‘chest voice’, for example. The sung voice presents in its pure and perfect—and, as we will see/hear, impure and imperfect—sonicity a corporeal identity and hermeneutic. In this chapter we look at ways in which other pop and rock musicians have performed and articulated—or been defined by (not least by me)—their visible physical disabilities and symptoms. Unsurprisingly, in society more widely ‘quantitative studies support the theoretical and qualitative work that suggests that physical disability has a negative impact on body image’ (Taleporos and McCabe 2002, 974), but what are the implications of that for cultural workers in a creative industry in which body image is both a transactional and expressive category? Rosemary Garland Thomson explains the operation of the ocularcentric pleasure of the performed text: ‘the visibly disabled performance artist generates the dynamic of staring, the arrested attentiveness that registers difference on the part of the viewer. In the social context of an ableist society, the disabled body summons the stare, and the stare mandates the story’ (Thomson 2000, 335). We will narrate and critically discuss some of these stories, and we will complicate others. There is particular reference to ways in which some successful musicians with a pop profile negotiated their public transformation, as a result of adventitious disability, to a stigmatised identity, an embracing of what Erving Goffman has termed ‘undesired differentness’ (quoted in Siebers 2008, 102). What happens to the star in pop’s corporeal culture when his TAB-ness ends, he is no longer ‘severely able-bodied’ (Paul Longmore, quoted in Thomson 2005, 33), no longer a ‘walkie-talkie’ (Ian Dury)? Terry Rowden has described ‘disability as a simultaneously individualizing and deindividualizing corporeal state’ (2009, 127, n. 27), and we will look at the cases of some musicians who have transitioned in public between individual and the newly-disabled deindividual. We will also look at a key experience within the neurodiverse, across two generations of stars and musics, with particular reference to the neurocognitive medical state of epilepsy and the role of some of its more dramatic and frightening symptoms in the onstage performance of rock. Of course, in any discussion of performing the body we should acknowledge the special, the extraordinary roles of the disabled here: as Carrie Sandahl and Philip Auslander remind us, ‘The notion that disability is a kind of performance is to people with disabilities not a theoretical abstraction, but lived experience’ (2005, 2). Through this book we have uncovered and interrogated some capacities of both pop and rock to function as themselves disabling cultures, with the profoundly ironic place of loud rock and dance musics as contributors to musicians’ and fans’ hearing loss at the heart of the discussion. Others we have touched on in music more widely are the historic figure of the castrato, and the (often minor for many but major for musicians) industry-related injuries caused by stress or repetitive strain through instrumental practice. Are there further disabling capacities in popular music, which we might reasonably characterise as a voracious, careless and indulgent industry? We have also explored many of the significant instances in which, arguably despite its remorselessly presentist focus on healthy, normatively sexually attractive, youthful bodies, popular music in fact often functions as an enabling cultural zone for those of its workers and enthusiasts with disabilities. As the industry has matured over (roughly) the past sixty years or so, and its people—the survivors, at least—have grown older and less able-bodied, it may well make greater sense that pop and rock begin to inhabit or become an inclusive, supportive space. The industry’s enabling capacity is probably one of its more surprising features, and is certainly one that requires careful qualification and delineation…. Let us complicate things a little further. In this final chapter we look at two important extra-musical aspects of the subject, which may seem each in turn critical and praiseworthy. That is, together they offer the opportunity for a dialogic consideration of the positions of pop and rock regarding our question of disability. As suggested, they are focused less on the music, voices and bodies of the stars and fans than on the contributory role of the industry itself, and its relation with disability. As constituents of a cultural industry, pop and then rock music—and then, as it emerged, the music-media end of celebrity culture—have developed certain practices of behaviour and lifestyle, of business engagement and (let us be in no doubt that we are uncertain—a rhetoric of) social advocacy, for instance. These have become so embedded in the industry that they have become a behavioural expectation or norm. And these industry practices and pressures matter particularly when we introduce disability to the discussion, when we crip ‘em…. First, we will consider the relationship between the trope of rock madness—cognitive impairment—and the pressures and temptations of the industry as themselves disabling…. 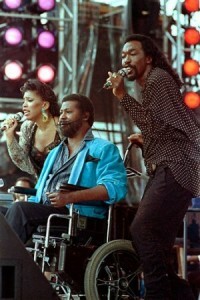 Second, we will look at the roles of disability advocacy and activism as cultural intervention within the realm of popular music. The argument in part is that disability campaigning in the mid-twentieth century set the template for much of the recent and current work around pop activism…. I am very interested and enthusiastic about your book for many reasons. One is that I wrote an article about Curtis Mayfield that appeared in RDS in 2008 and I’d like to know about your observations on his life and career. Hi George, really would love to read the book – is it any closer to coming out? Shakin’ All Over is published in the autumn, in a couple of months time. I hope you like it. Let me know! When’s the book coming out? I’d love to read it! I am an anti war painter , live and work in Tehran , Iran , very impressed with your Book and hope you also release a related issue in fine art history . I also invite you to see the War collection paintings in my website galleries . Great stuff George, I can’t wait for the book! Your lecture a few years ago in Sydney on Ian Dury was an inspiration for a lot of people. Hopefully see you at the jazz conference in Salford next year.